The Swans blew the Saints away early with the first nine goals of the game. Sydney kicked 10.5(65) from stoppages, above their season average of 32.8. The Saints lead contested marks eight to two in the second half after trailing six to one in the first. After scoring 9.3 (57) from stoppages in the first half, the Swans have managed just two behinds from stoppages in the second half. The Saints are yet to kick a goal from a chain starting in their forward 50. They average nine points from this zone in 2018 (ranked 18th). In the defensive 50, the Swans have had 69 uncontested possessions to 33, handballs are 48 to 10 and tackles are 19 to nine. L. Franklin now has seven marks inside 50; his equal best this season. The Swans lead marks inside 50 20 to eight. 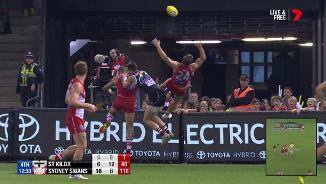 In the third term, the Swans had a kick to handball ratio of 1.64 in the forward half and a ratio of 0.58 in the defensive half. 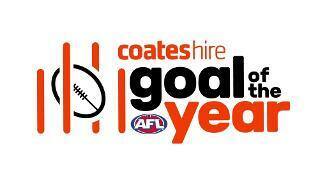 The Saints lead forward half contested possessions 56 to 41. During the third quarter, the Swans have managed two goals from six inside 50s whilst the Saints are yet to kick a goal from 14 inside 50s. Since quarter time, the Saints lead inside 50s 27 to 18 and contested possessions 57 to 53. The Saints lead third quarter inside 50s nine to four but are yet to convert to a goal. L. Franklin has five marks inside 50 tonight, his highest tally in 2018 is seven. 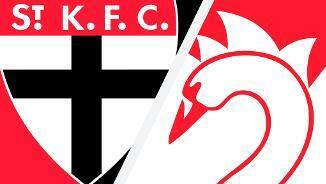 The Swans have had 17 handball receives compared to St Kilda's four in the third quarter. The Swans kicked the last four goals of the second term. During this streak, they led marks six to zero, inside 50s four to one and disposals 20 to 15. The Swans have scored 42 points from their defensive half tonight. In 2018, they average 28.7 points from this zone. P. McCartin has taken three marks inside 50 and kicked one goal and two behinds in the second term. The Saints have scored from 67 per cent of defensive 50 chains in the second quarter. In the first term, they didn't register a score from the defensive 50. The Saints have won clearances seven to two in the second quarter after trailing by 12 in the first term. The Saints lead ground ball gets 12 to seven in the second quarter after trailing 29 to 22 in the first. In the last ten minutes of play, the Saints lead inside 50s eight to four and have kicked two goals to zero. A Swans blitz saw the Saints concede nine first quarter goals for just the third time since 1999. I. Heeney was influential for Sydney with eight disposals, five contested possessions, four tackles and a goal. 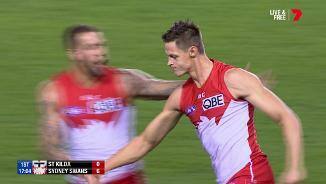 The Swans have kicked nine first quarter goals one other time since 1999. This came against the Dogs in round 10, 2012. The Swans have eight first quarter goals which is their most this season, their second best was five first term goals against the Eagles in round 1. Sydney has five early marks inside 50. This season, the Swans average 10.4 marks inside 50 (ranked 13th). The Swans have won the first seven clearances from ball ups and throw ins. From these, they have sourced three goals. Despite trailing by 23 points, the ball has been in the Saints forward half for 63 per cent of the game so far. The Swans have kicked three goals from their first three inside 50s. In 2018, they average a goal from 24.1 per cent of entries (ranked 8th). The Swans have won two clearances and kicked two goals from the two throw ins so far tonight. Across the past four weeks, St Kilda has averaged 5.67 disposals per turnover. This is the thirdbest rate recorded by any side. 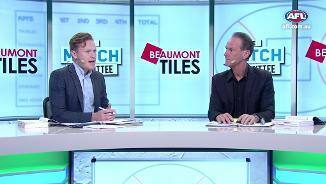 Since 2015, the Swans have won the contested possession count by 15 per game against the Saints. This is the secondbest differential against them in this time. Welcome to Etihad Stadium for the St Kilda v Sydney Swans Round 12 clash. 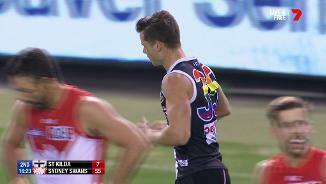 ON A NIGHT celebrating pride, pride was all St Kilda had to play for after quarter-time at Etihad Stadium on Saturday night. 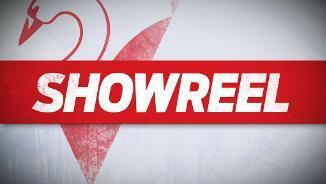 By that point of this year's Pride Game, Sydney had all but put the result of the game beyond doubt. The Swans led by 48 points after kicking the match's opening nine goals and had just recorded their highest-ever first-quarter score against St Kilda – 9.1 (55) – and established their biggest-ever quarter-time lead over the Saints. It seemed Alan Richardson's 100th game as St Kilda coach was destined to be a nightmare, with a belting in the offing the likes of which the Saints had not endured since the coach's early days at the then rebuilding club. Fortunately, St Kilda, although thoroughly outclassed, showed some pride in the final three quarters, to limit the Swans' winning margin to 71 points. The Saints' effort improved markedly from the start of the second quarter and they at least kept fighting to the end, outscoring the Swans in the final quarter. But they could not stop Sydney from cruising to a 19.12 (126) to 7.13 (55) victory, in what was their biggest loss for two years. It continued their horror start to a year in which they were widely predicted to return to the finals for the first time since 2011.The Saints remain winless since round one, their worst start to a season since 2000, when they won just two games for the year. The Swans' victory was their ninth straight over St Kilda and fifth win in a row, helping them climb above Geelong into third on the ladder on percentage. Etihad Stadium has been a happy hunting ground for the Swans recently, with Longmire's men having now won 14 of their past 15 games at the Docklands venue. Sydney belted St Kilda at the clearances, 39-27, with Josh Kennedy (31 possessions, six clearances and one goal), Isaac Heeney (27 possessions, six clearances and one goal) and George Hewett (19 disposals and five clearances) doing the damage. Hewett also performed an outstanding run-with job on Jack Steven, holding the usually prolific Saints star to just 13 possessions. Lance Franklin (4.4 and 12 marks) was lively in attack and climbed to fourth in the Coleman Medal race, four goals behind leader Ben Brown (35). 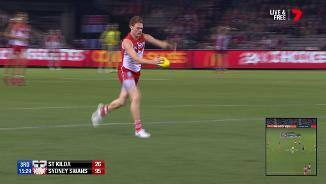 Second-year midfielder Oliver Florent (27 possessions) was also impressive, while Callum Sinclair (14 possessions, 29 hit-outs and three goals) had the better of his ruck contest with Tom Hickey, and Jarrad McVeigh, Dane Rampe and Heath Grundy kept things tight in defence. 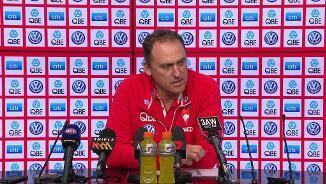 Sydney coach John Longmire praised his team's "fantastic start" to the game. "To get off and play so efficiently … we were really efficient in that first quarter and we were selfless around the goals," Longmire said. "We were able to hit the scoreboard with straight kicking, which makes a difference. That first quarter was really important. "They were able to transfer the ball a bit too easily across the length of the ground sometimes. "There were some things we need to tighten up, but we exerted a fair bit of energy and effort in that first half." 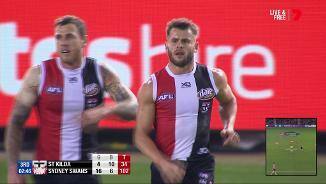 Despite the fact they won the inside 50 count 55-49, St Kilda failed to reach 60 points for the sixth time this year. On a tough night, Seb Ross (25 possessions and five clearances) fought a rear-guard action in the midfield, while Jimmy Webster (24 possessions) and Bailey Rice (20) battled hard in defence. Richardson pulled no punches when asked about his team's dismal opening quarter after the game and took little solace in its improved performance thereafter. 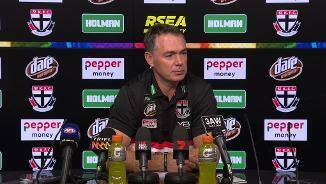 "(We were) smashed, just beaten comprehensively everywhere by an outstanding footy team," Richardson said. "We just weren't in the fight, weren't in the game. "We came in with a young defence, it was good to have 'Browny' (Nathan Brown) there. 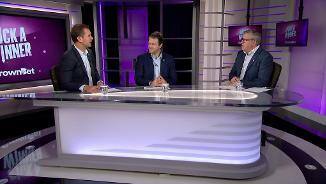 Whenever they went forward they looked cleaner, certainly tougher, they were a ruthless footy team, and we were far from that. "That was really the game." 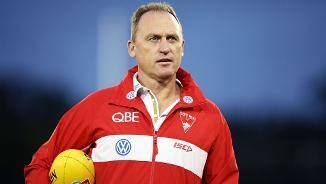 Richardson has never coached a win against Sydney counterpart John Longmire, with the Saints' last win over the Swans coming in round nine, 2012, at Etihad Stadium. The only member of the Saints' team on Saturday night who played in that game was Steven. St Kilda: Key defender Nathan Brown did not return after half-time after suffering a concussion. 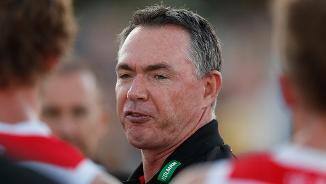 Coach Alan Richardson said the Saints would have to wait and see on Brown's availability next round, with the veteran set to undergo the standard concussion tests next week. 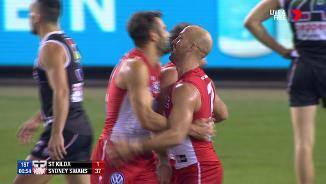 Nathan Brown was ruled out of the game with concussion after this contest. 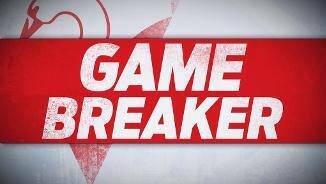 Sydney: The Swans emerged from the game with a clean bill of health. The Saints play Gold Coast at Metricon Stadium next Saturday, having lost three of their past four games at the Suns' home ground. The Swans host West Coast next Friday night at the SCG, where they have beaten the Eagles in their past six encounters.